U.S. retail sales of medium-duty trucks rose 6.2% in June, largely relying once more on strong Class 6 sales to power the overall gain, WardsAuto.com reported. Sales for Classes 4-7 trucks were 21,611 compared with 20,350 a year earlier, according to Wards. As was the case in May, Class 6 sales provided nearly all the muscle — rising 21.3%. Class 7 for the month was up 3.6%, while Classes 4-5 sales inched up 0.2%. 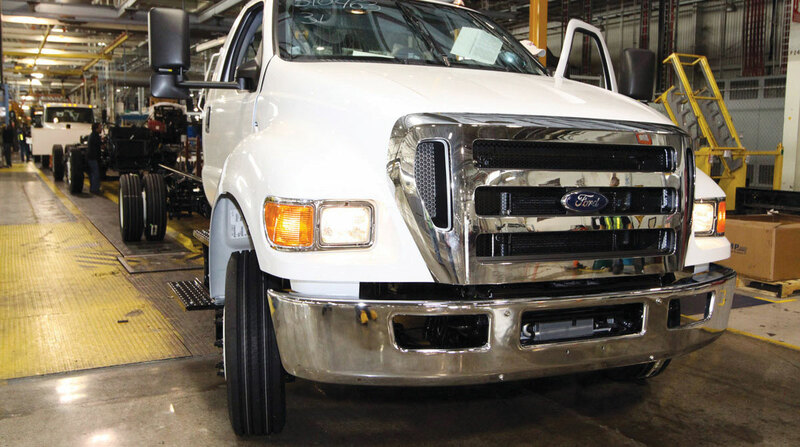 For the first six months, medium-duty sales climbed 6.9% to 116,247. One analyst said medium-duty sales this year have not been a big departure from 2017 and probably will end the year that way. “We are coming into the summer months when things tend to slow down a little bit, and there is just not that kind of hair-on-fire demand in the medium-duty space that we see on the Class 8 side,” ACT Research Co. Vice President Steve Tam said. In Class 7, two truck makers, between them, accounted for nearly 75% of the total sales of 5,538. Freightliner, unit of Daimler Trucks North America, was at the top with 2,620, good for a 47% share. International, a unit of Navistar Inc., was next with 1,434 for a 26% share. For the first six months, Class 7 sales rose 5.5% to 29,282 — with Freightliner garnering a 52% share. Class 6 sales reached 5,977 units in June and reflected keen competition among three truck makers. Ford Motor Co. was the sales leader with 1,947 and a 33% share. “In my mind, this is a departure from their normal seasonality,” Tam said. Freightliner was next with 1,747, or 29%. International posted sales of 1,191, or 20%. Year-to-date, Class 6 climbed 9.8% to 36,798. Freightliner led, followed by Ford and International, respectively. According to a recent survey of some Freightliner dealers, the wait for their medium-duty trucks is growing. “Contacts noted that there continues to be strong demand for medium-duty trucks, but lead-times for medium-duty trucks are out until 2019,” wrote Neil Frohnapple, director of equity research, Buckingham Research Group, in a note to investors. Sales of Classes 4-5 hardly moved in June, rising just 0.2% compared with a year earlier. For the first half of the year, Classes 4-5 sales improved 5.7% compared with the 2017 period.